Do You Know What Tax Bracket You're In? Do You Know What Tax Bracket You’re In? One of the sureties of life is that you need to pay taxes. One of the questions that many people ask is what tax bracket they are in. The United States has a marginal tax bracket system. This means that you pay taxes depending on which income range you fall into, and that you pay a greater percentage of your taxes as you earn more income. First of all, it’s important to understand that what tax bracket you are in depends on your taxable income, and not your gross income. So if your salary is $50,000 a year, you won’t actually be taxed on that amount. You have the chance to claim deductions and exemptions, lowering your income for tax purposes. You might actually only end up being taxed on $38,000 of your income. Next, you look to see what tax bracket you are in. Your tax bracket depends on your filing status. If you are filing single, that $38,000 would put you in the 25% tax bracket. Someone married and filing a joint return, though, would be in the 15% tax bracket. 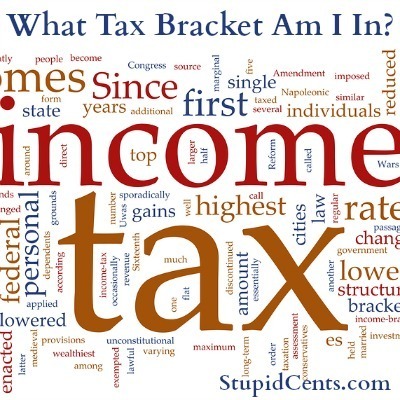 After you figure out which bracket you are in, it’s important to understand that your entire taxable income isn’t subject to the rate shown for your bracket. The marginal tax system means that you pay only on the amount that is above the last tax bracket. So, if you are filing singly and in the 25% bracket, you would pay 10% tax on the first $9,075 that you earned, then 15% on the amount $9,076 to 36,900. Finally, you would only pay 25% on the amount from 36,901 to $38,000. So you are really only paying 25% on right around $1,100. Since what tax bracket you’re in doesn’t reflect that your actual tax rate, some people like to look at effective tax rate. In our example, you would end up paying a total of $5,491.98. When you divide that by your gross income, not just your taxable income, you end up with an effective federal tax rate of 10.98%. So, a marginal tax bracket sounds like you are paying more in taxes than you actually are. However, you should also bear in mind that federal income tax isn’t the only tax you pay. Your federal income effective tax rate might be lower, but your total effective tax rate might be higher than you thought. If you include the payroll taxes you pay, state income taxes, sales tax, property tax, and all the other taxes that are a part of modern living, you might find that you have a higher effective tax rate than you thought. Determining what tax bracket you’re in is fairly straightforward, at least when it comes to federal income taxes. But it’s also a good idea to remember that there might be other taxes you pay. Your federal income tax bracket might be fairly low (and your effective rate even lower), but what you really pay in taxes might surprise you.